The church's electoral roll is the register of its voting members. Electoral rolls provide an indication of the real membership and strength of the church. Enrolment is a way of saying..... "I belong". 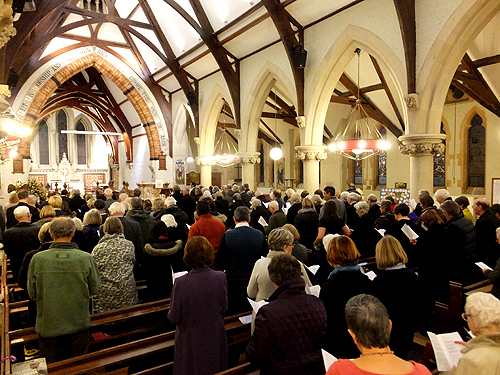 For us it is an act of commitment to St James's Church and the Church as a whole. It opens the way for greater involvement in the life of the Church at parish, deanery, diocesan and national levels. 1. A member of the Church of England (or of a Church in communion with the Church of England) and resident in the parish. 2. 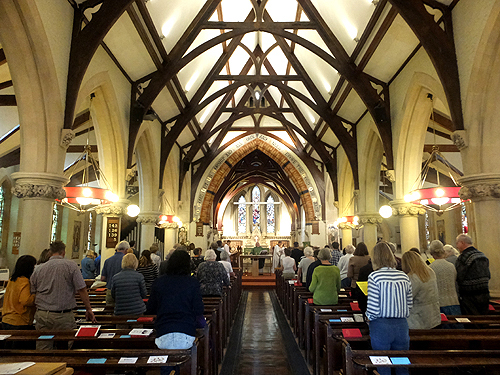 A member of the Church of England (or of a Church in communion with the Church of England) and, not being resident in the parish, have habitually attended public worship in the parish during the six months prior to enrolment. 3. A member in good standing of a Church (not in communion with the Church of England) which subscribes to the doctrine of the Holy Trinity and also declare yourself to be a member of the Church of England, and have habitually attended public worship in the parish during the period of six months prior to enrolment. Everybody whose name is on the electoral roll is entitled to attend and vote at the Annual Parochial Church Meeting which is held before the end of April each year. The Parochial Church Council is elected at this meeting. All you have to do is ask for an application form or download it from this website (see below) fill it in and hand it in to the parish office, the sidespersons or the churchwardens. You will then be added to the roll. 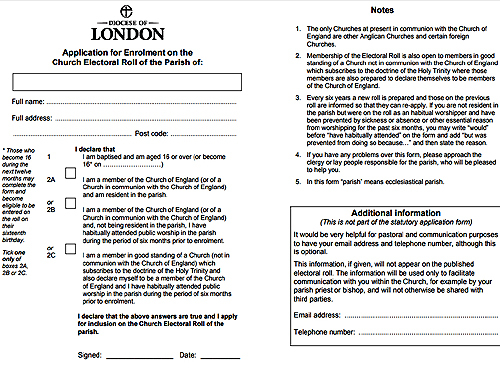 If you have any questions or concerns about this form, please approach the churchwardens or the administrator in the parish office. Under the terms of the Data Protection Act the information declared on this form will be stored and used only by St James’s Parish Church for internal use. This information will not be passed on to any third party. 1. If your 16th birthday falls in the next twelve months, you may complete the form and become eligible to be entered on the roll on your birthday. 2. The only churches at present in communion with the Church of England are other Anglican Churches and certain foreign churches. 3. Every six years a new roll is prepared and those on the previous roll are informed so that they can re-apply. If you are not resident in the parish but were on the roll as an habitual worshipper and have been prevented by sickness or absence or other essential reason from worshiping for the past six months, you may write 'would' before 'have habitually attended' on the form and add 'but was prevented from doing so because...' and then state the reason. 4. Membership of the electoral roll is open to members in good standing of a church not in communion with the Church of England which subscribes to the doctrine of the Holy Trinity where those members are also prepared to declare themselves to be members of the Church of England. 5. In this form “parish” means ecclesiastical parish.